My cupboards are full and happy, Just the way I like them to be! For some neurotic reason I straighten them out a few times during the week. It's good to know what I have purchased during one of my famished trips to the grocery store. All my money seems to go into baking supplies. I try to buy 'real food' but like a moth to a flame, I am drawn to the aisle which is filled with flours, sugars, nuts, chocolate, and interesting flavoured baking chips. So if you were to ever come over, you would think I was a basket case. My refrigerator is empty, save for a few yogurts, about 3 cases of sticks of butter, 2 cartons of eggs, and a ridiculous amount of heavy whipping cream. My cupboards, however, hold enough food supplies that could keep me baking in blissful ignorance for months during a nuclear fall out. I had a bag of Hershey's cinnamon chips in my cupboard since August before I finally decided to do something with them. The only think which kept me from using them was a fear that they would have that waxy, artificial taste that some baking chips contain. On their own the chips did not have much of a cinnamon flavour, But I wanted to give them a fighting chance and hopefully breathe some life into them via a chewy cookie. I think that the baking process really brought out the cinnamon flavour that had been hiding in the cold, hard chips. That and the addition of ground cinnamon. I also threw in a little bit of nutmeg and allspice in honor of the Autumn season. A mild spicey warmth of the throat is a welcome feeling when the weather is chilly. For the cookie dough, I just used the bones of a chocolate chip cookie recipe. The only difference was the use of cinnamon chips, cinnamon, allspice and nutmeg. They were pleasently chewy in the middle, with a nice caramely crunch along the edges (thanks to an overnight refrigeration).If I were to make these again, I would like to try adding some dark chocolate and/or chopped walnuts. 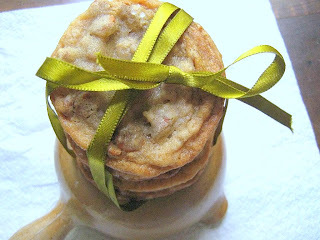 The cookies needed a little something extra to cut into the sweetness. But everyone liked the taste!If you are in a hurry, you don't have to refrigerate the dough as long as I did. But at least let it chill for an hour. And be sure to keep an eye on it. As with all cookie doughs, people can't seem to keep from sneaking a spoonful or two from the bowl. They think I can't tell. But trying to cover up the tracks of a spoon with more tracks of a spoon just doesn't work. 1 cup ( 2 sticks of butter ) at room temp. In a small bowl, sift together the flour, baking soda, salt, cinnamon, nutmeg, and allspice. Set aside. In a large bowl, on medium speed, beat the butter and sugars together for about 2 minutes until light and fluffy. Reduce the speed to low and add the eggs, and vanilla. Beat until well mixed for about 1 minute. Slowly add the flour mixture and mix until just combined. With a large wooded spoon, stir in the cinnamon chips. Preheat the oven to 350F. Line baking sheets with parchment paper. 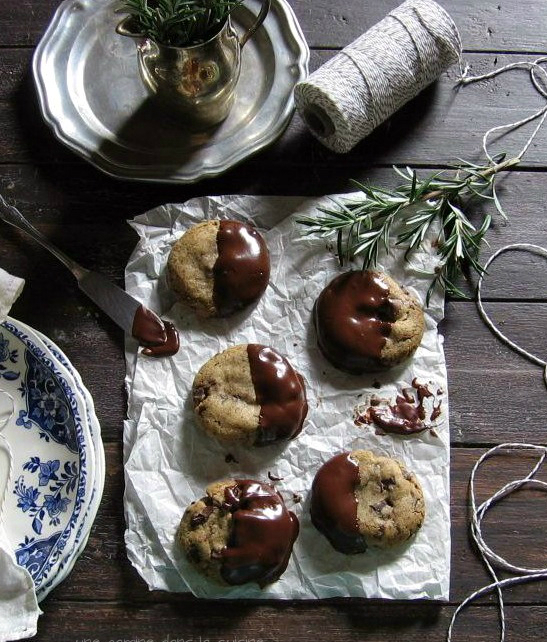 Use a heaping tablespoon for each cookie and place at least 2 inched apart on cookie sheets. Bake for about 8-10 minutes. The cookies should still be soft in the middle. Let them sit on the sheet for 3 minutes before transferring to a wire cooling rack. Gosh, I love a nice spicy cookie. These look delightful!! I love a good cinnamon cookie! especially when they are chewy! These look seriously good. I wonder if toasted pecans would be good in them, to cut the sweetness and add some flavor? 2 teaspoons of salt is a large amount for a cookie recipe? Is that a typo error. 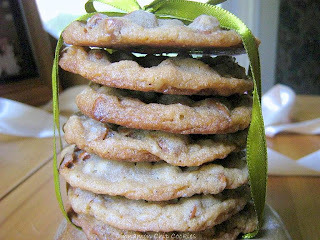 In your headnotes, you say next time you make these cookies you will add some dark chocolate and chopped nuts. 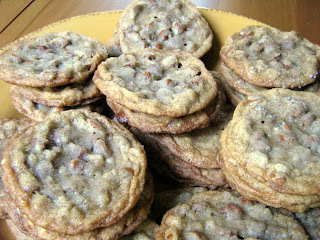 How much chocolate and nuts will you add to these cookies and what kind of nuts. Maybe about 1 cup of chopped chocolate and 1/2 cup of walnuts or pecans.